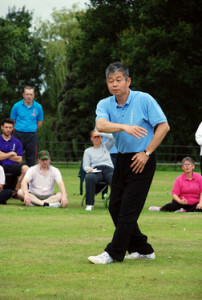 When we are practising Qigong, it is easy to feel the Qi flowing inside. In the beginning, we just feel warm, feel good and then might start to feel tingling in the hands and in particular the finger tips. Then as we practise more, we begin to feel things in other parts of the body. At first you might find these feeling unusual, but in the end you will feel good. This is most important. Once we have started practising the body will begin to become more active inside and will respond more to the outside. If we want to be healthy, then we need the internal body to be more active and sensitive, more than usual. Then you can gather more Qi from outside the body. The external body should also relate, respond and be more connected to the internal body. This means when we move our arms or take a step, or turn our waist, it is not just our arm, leg or waist moving, but instead the movement comes from inside the body. This is the natural way and why we should always remain relaxed as it helps the internal and the external body connect more deeply. Then the Qi can flow better and more strongly, then the healthier we are.